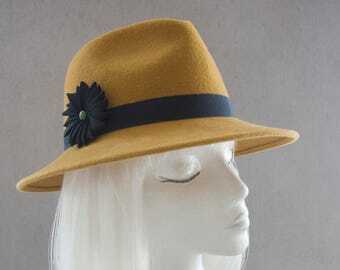 Gorgeous yellow gold fur felt fedora-style hat. A little bit vintage-inspired, and a little bit modern. Pair this with a pair of fabulous shoes for a street-style worthy look! 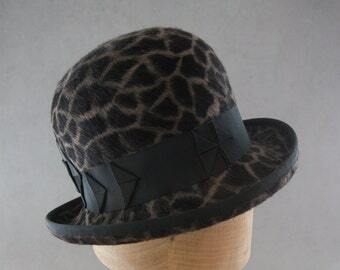 100% fur felt in "Vienna gold" color, blocked by hand on a wood hat block with an asymmetrical cut crown. 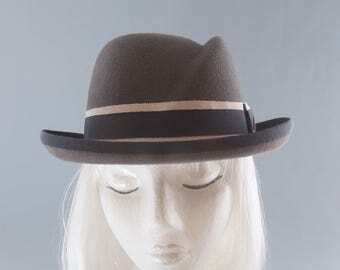 The brim was then further shaped by hand to give it a jaunty and dramatic upturn at the left side and back. The brim is wired to hold its shape, and the edge of the brim is folded down and sewn into place using a special invisible stitching technique. The right side of the hat is decorated with a black onyx Celtic knot ornament set on a piece of black grosgrain ribbon and with a fringe of silver black bugle beads and faceted onyx beads. The bugle beads are antique glass beads from the Victorian era! 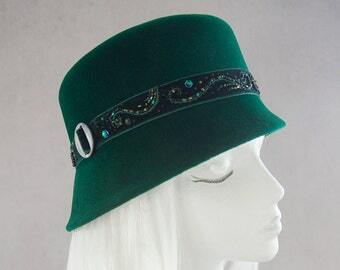 Inside is unlined and is finished with a light green head size ribbon and Silverhill Creative Millinery brand label. 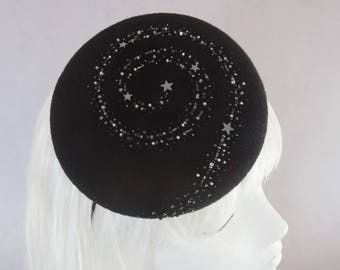 Starry Night Cocktail Hat. Black Hand Beaded Stars Fascinator. Holiday Party Hat. Couture Millinery Headpiece. Fancy Dressy Celestial Hat. Brown Fur Felt Beret. Shiny Long Hair Felt Hat with Swarovski Crystals, Freshwater Pearls. 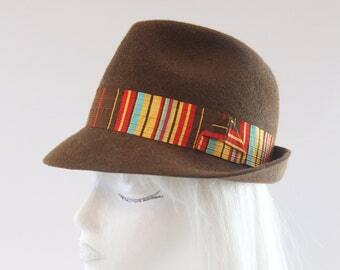 Autumn Fancy Brown Beret. Ladies' Millinery Hat. Gray Bowler. Wool Felt Hat w/ Cranberry Ribbon, Beads. Tilt Hat. 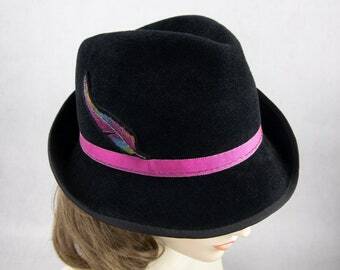 Perching Ladies' Felted Derby. Grey Hat. 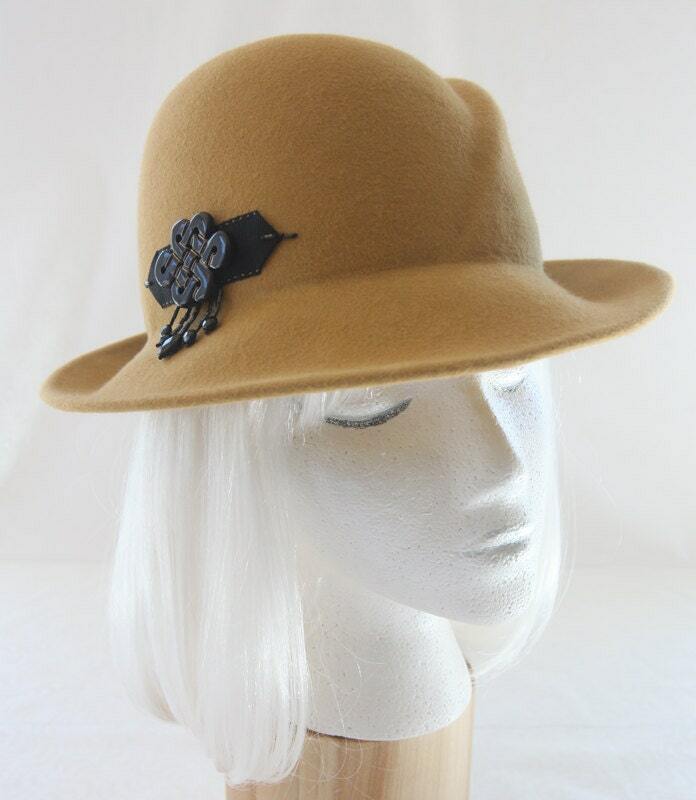 OOAK Millinery. Extra Small Hat.